It really is a great show and the Lieutenant Gov answered all questions. Tune in now. Last week we tested a social media experiment. Our goal was to create a few Facebook Fan Pages for various parts of the SW Florida real estate market and see if we could drive 100 fans to each. If we could do that, we could signup for Facebook unique URL’s. We’re happy to report that not only did we hit our goal of 100 fans, we far surpassed it in only a week. Currently we’re over 400 users on our Ellis Team site, and close to that on others. The advantage of signing up on one of these pages is that we post timely news pertaining to each area, specific to that geographic location, or in the case of The Ellis Team site, about real estate marketing in general. We provide discussion boards, Blog posts, nes paper articles, video updates, photos, and much more. Our new goal is to hit 1,000 users by the end of the month. Can we do it, who knows? There’s no magic reason we picked this number, it just sounds fun. We’ll post the web links here for Facebook users to follow us, and our Twitter addresses too for our Twitter users. We look forward to connecting with you on many levels. We still do business the old fashioned way, and we still advertise in traditional methods like newspaper, TV, and radio. We are however expanding our reach into the Social Media markets to better serve our customers, and we look forward to seeing you online. We’re doing something new this week for the Future of Real Estate Radio Show here in SW Florida. This week’s special guest is Lee County Property Appraiser Ken Wilkinson, and this week we video taped the show as it was being broadcast and we’ve decided to bring it to you in video format as a test. We’ve separated the broadcast into 6 parts so you can watch any and all parts that interest you. Posted in Southwest Florida Real Estate. 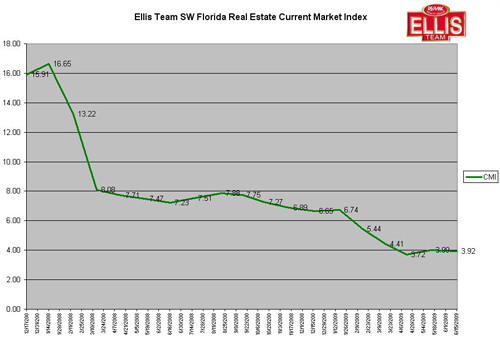 The Ellis Team SW Florida Real Estate Current Market Index for June 2009 shows another slight improvement, down from 3.99 to 3.92 Remember, the lower the Index number, the better for sellers, and if you’ve followed this index for any length of time you’ll discover that it’s been very accurate forecasting the foreward movement of the Fort Myers real estate market and the Cape Coral real estate market. Inventory fell from 12,579 last month to under 12,000 for the first time in a long time. Inventory levels have been falling for awhile and pending sales have remained relatively stable, helping to draw down inventory levels. Cape Coral inventory levels are very low, but so is Lehigh Acres copared to the pending sales. Lehigh Acres has traditionally followed Cape Coral, and as the Cape’s prices have gone up in the entry level home market, Lehigh Acres demand has increased, just like in the run-up of the roaring 2000’s. The Ellis Team are Top agents at RE/MAX Realty Group in Fort Myers Florida and study the SW Florida real estate market in great detail.